Although I’ve dined Rama V only once, I remembered it well. It was a beautiful restaurant furnished with wooden interior, surrounded by ponds with lotus blossoms and offered delectable Thai food. 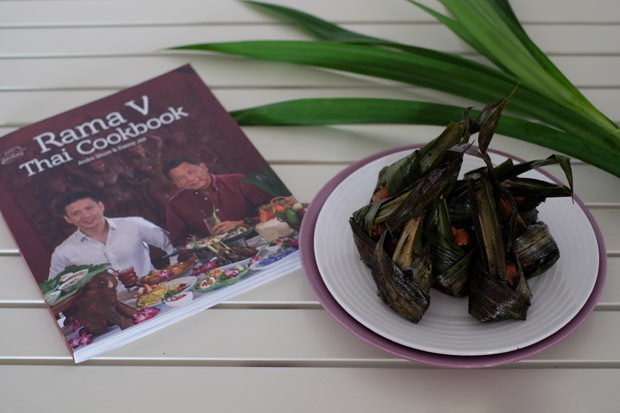 Naturally, I’m delighted to get my hands on Rama V cookbook and marked many simpler recipes with post-it notes such as tom yum kung, Thai-styled grilled steak with tamarind sauce and chestnut in coconut milk dessert. 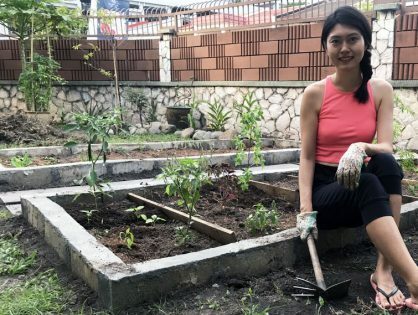 Though I love to cook, I believe in the importance of simple recipes with a short list of ingredients. Such recipes makes cooking easier and encourage us to cook more. 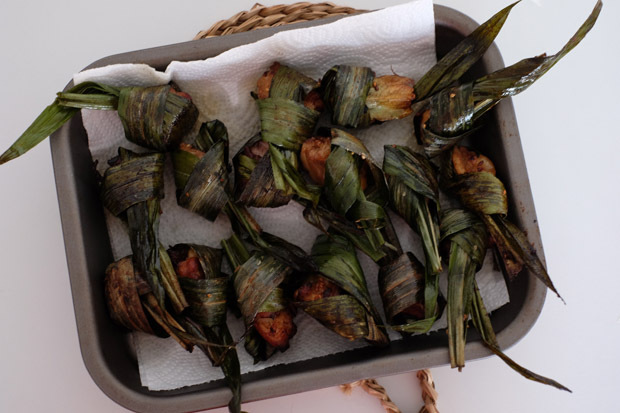 Here’s a dish with most of the ingredients already in my pantry: fried chicken in pandan leaves. Although it’s rather laborious (you need to wrap the chicken, steam and then fry them), the result is worth it. White pepper x 1/8 tsp OR a about 10 dashes. Gather all materials and tools. 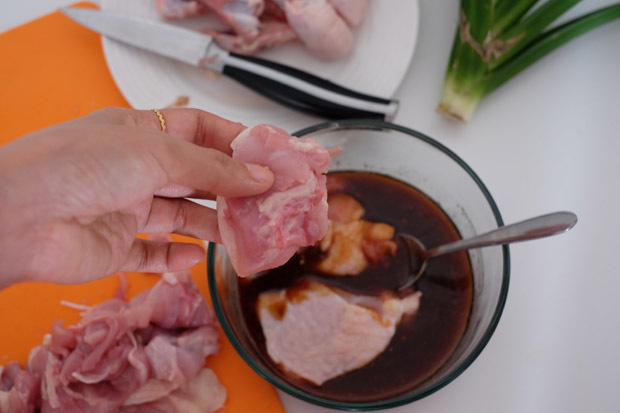 Debone chicken thigh and chop into sixteen chunks (Keep bones to make chicken stock). Add oyster sauce, soya sauce, chili sauce, tomato sauce, sugar, sesame oil, sesame seeds, white pepper and chicken stock powder in container with lid. 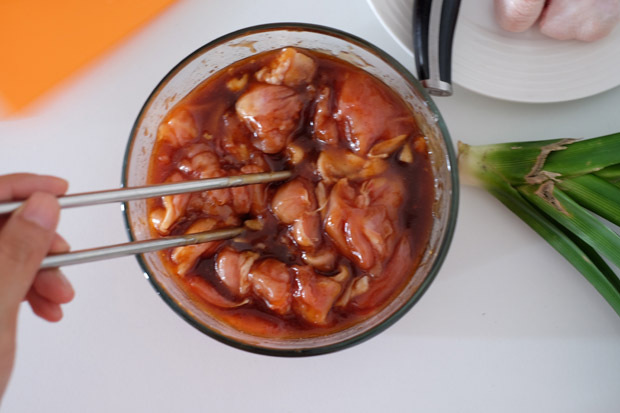 Mix well, add chicken chunks into it, pop it in the fridge and let it marinate for 1 – 2 hours (or overnight). 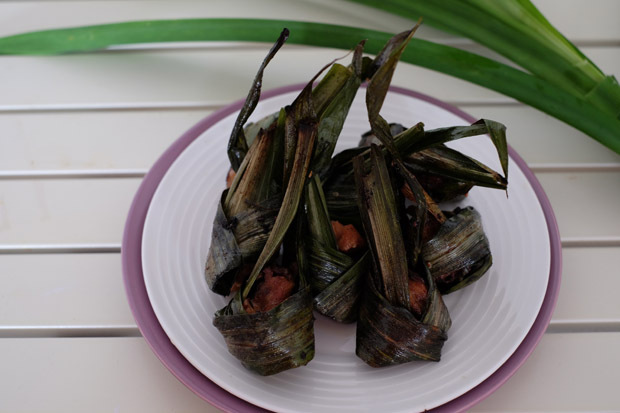 Fold pandan leaves according to the photo below. 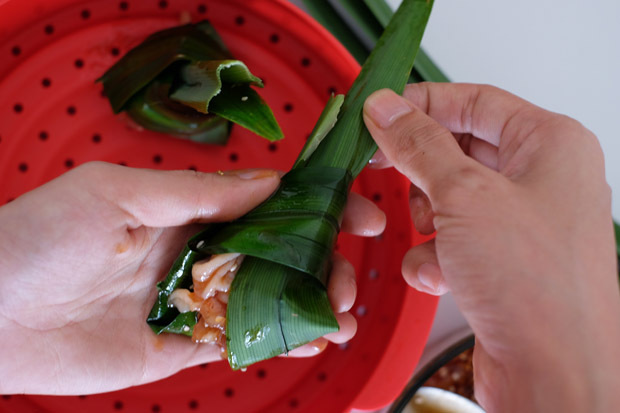 Scoop marinated chicken onto one pandan leaf and roll leaf around the meat to wrap it up. Repeat until all chicken is used up. 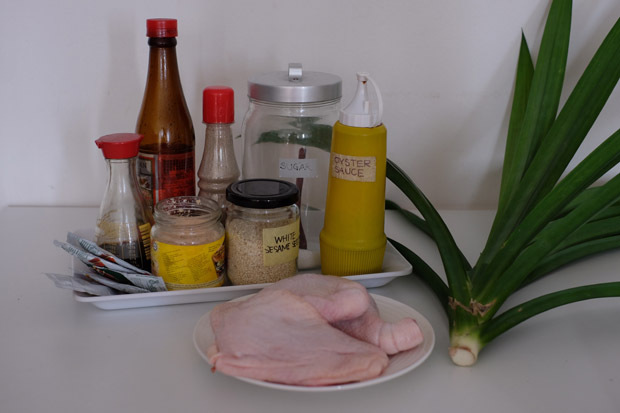 Place wrapped chicken on a plate suitable for steaming. 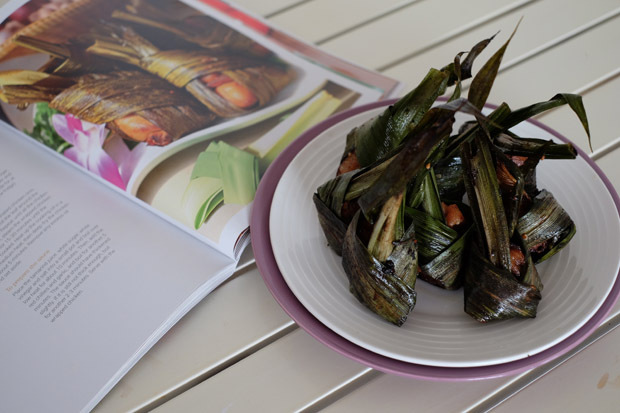 Note: It’s very important to use big pandan leaves. Smaller ones do not hold the chicken well. Add water into a wok with steamer. Turn on the heat to boil. Once boiling, add the plate of chicken and let it steam for 15 – 20 minutes until the chicken is cooked. Heat up the cooking oil in a pot on medium heat, then deep-fry the chicken for about 5 minutes. Remove excess oil and place on a tray of paper towels. Ingredients in the original recipe uses ‘gram’, I changed them to tablespoon as it’s much easier for a home cook. Rama V suggests 30 g tomato sauce. I found that’s equivalent to 3 packets of tomato sauce that you get from fast food restaurants. You will be left with quite a bit of sauce from the marinate. Keep it to marinate more chicken and stir fry them with mushrooms. Although the chicken is already cooked through steaming, it’s important to fry the chicken for 5 minutes as suggested. 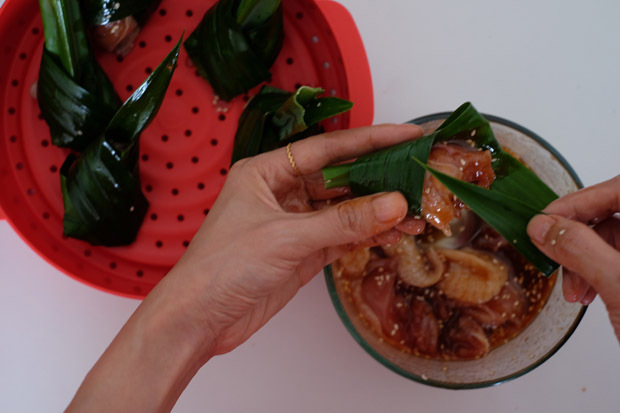 This imparts the fragrance of pandan into the chicken. If you want the chicken to look prettier, after wrapping the chicken, cut off excess leaves on top and leave about 2 inches. 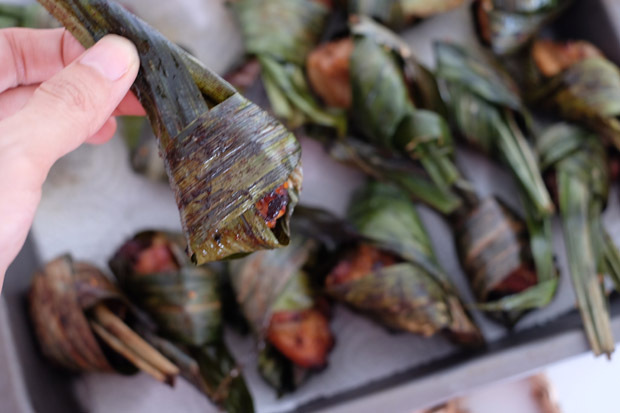 If wrapped properly, the pandan chicken can stand on it’s own. Oh, I think this dish is so yummy and pretty; can’t wait to serve them at the next dinner party! 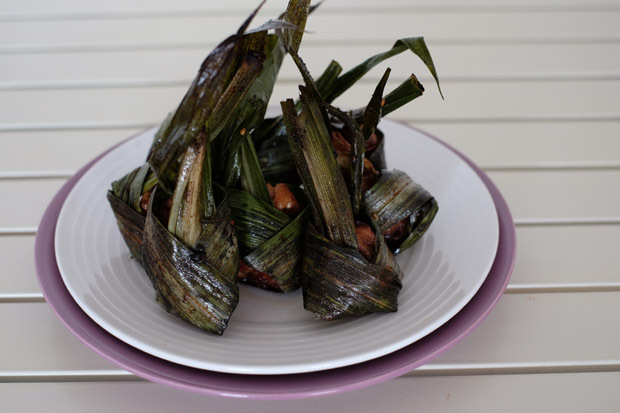 What are your other favourite thai food? Let us know and you might see the recipes here in JewelPie soon! 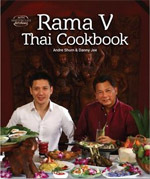 Rama V Thai Cookbook Opened in 1995, beloved Thai fine dining institution Rama V almost closed down in 2009. 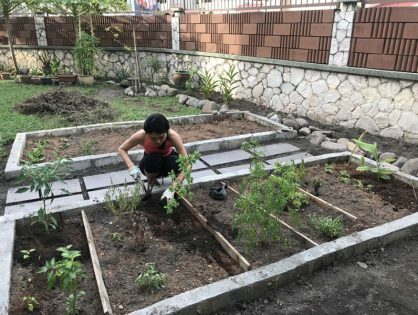 F&B entrepreneur Andre Shum and travel industry veteran Danny Jee swooped in and took over the restaurant along Jalan U-Thant in the heart of Kuala Lumpur. 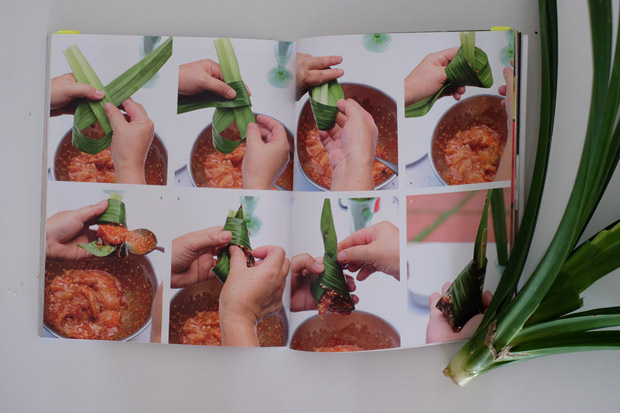 Now, the duo have come up with a cookbook containing mostly recipes from Rama V, part of their efforts to ensure the flavours of the now two-decade-old establishment will not be forgotten.